As enterprise flash storage technology moves from infancy to maturity, what should IT planners, like yourself, expect from this high-performance, low-latency technology now? Better yet, what can you look forward to in the future? 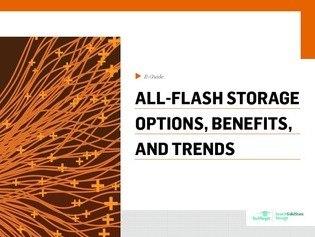 In this e-guide, experts examine the benefits of flash for individual servers, solutions that aggregate flash across servers, and flash for shared storage systems. Learn which options are most likely to bring value to your organization depending on use case and your available budget. Access now and you'll also uncover expert predictions for flash technologies in 2016.